And here’s another car making its debut at CC, thanks to Cohort poster Owen Smith. This is the third generation of Corona to arrive on our shores, but since the first was called Tiara, and not many were sold here, it’s fair game to call this the second Corona. We have covered its predecessor in considerable detail here. 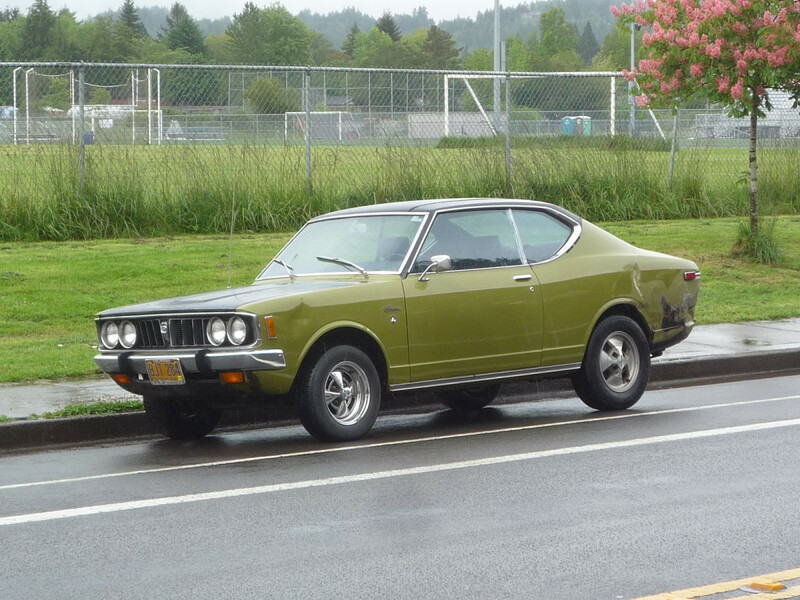 This new Corona arrived in Japan in the spring of 1970, but I’m not sure whether it was sold here that soon or a bit later as a 1971 model, and ran here through 1973. That was a short run, and may explain why they are pretty rare. As far as I know, this was essentially a new platform, but it largely followed the previous model in concept and configuration. What was new was the engine, as the venerable pushrod four gave way to the SOHC 1.9L 8R 14, soon upgraded to the 2.0L 18R-14. Styling had clearly moved out of the early 60s and into a new decade, although the Corona was still pretty conservative. And it stayed that way, all through its subsequent iterations. No Nissan-style wild and crazy experiments for Toyota. From the rear, this Corona look just like what it was: a bigger brother to the Corolla, which had became Toyota’s top seller. But the Corona continued to be a solid seller for some years yet, before it went into a gradual decline. It took a new FWD Camry to reignite Toyota’s family sedan. I did shoot this coupe version here a few years back, and wrote it up, but as an Auto-Biography that touched on my high school years. It was one of my more prized finds up to that point. So why did I waste it on that drivel? I had a 71 RT80?, anyway it had the pushrod engine it was quite reliable, fairly economical,but handled poorly with vague steering, it was assembled by Australian motor industries AMI and had a little badge on one front mudguard saying so, A Canadian friend had a 73 Australian edition that also had a pushrod engine maybe the 18R wasnt used there in this body, NZ models were different again, featuring column shift Ive only driven ones like I had with floor shifted four speed and mine had AC which acted like an engine brake, Great little car while it lasted though. AMI saved the 18R until the next Corona generation when they made a big thing of it in their advertising; these all left the Aussie factory with the pushrod 1.6. Outstanding find! I haven’s seen one in 25 years. My grandfather the carpenter had a 71 Corona, which seems quaint in this era of bro-dozer driving construction workers. 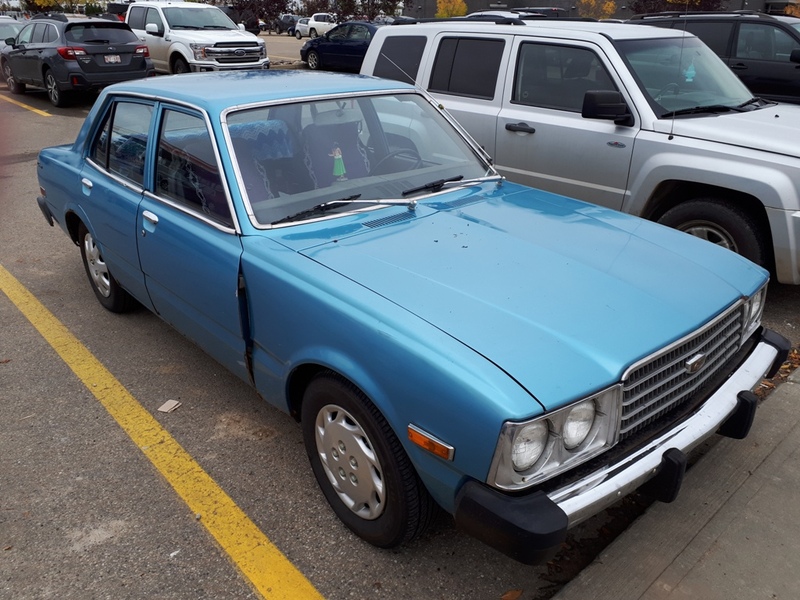 1974-1983 coronas are very common here still and most of them are sky blue for some reason but engines are 1.6&1.8 Litre and All of those are stick shift.No automatics. Just. Wow. The sad thing is that I never paid attention to these when they were here, and since they went away I never see one to pay attention to. Comparing the degree of windshield rake on the adjacent cars, and the corresponding effect on aerodynamics for both designs, might be very telling in terms of their drag coefficients. Even for a ’73 car, the Toyota’s windshield appears quite upright. Likely to help accommodate head room. family and i were just at the Toyota manufacturing plant in southern indiana. They had an early 70’s corona there. pristine condition of course. It was very interesting to see how far we’ve come. the factory tour (free) was outstanding. highly recommended. If I were asked to think of a color I have seen a Corona in it would be that green one. This car, in a sad brown, was the car that broke through the nothing but American collection of cars in our neighborhood. Our next door neighbors had 8 kids, and they weren’t even close to the largest family, that title was shared at 13 each by two families, followed by one with 10, our next door neighbors with 8, and one with 7. The cars next doors were all Chevy from when we moved in in 1965, until the day the Corona came to love next door in ’73. It opened a floodgate of foreign cars in both their house and the neighborhood in general. VW Beetles appeared one after the other, along with one woman’s Mazda RX4, which was interesting for it’s sound alone. A couple of Honda Civiics appeared just as I moved out west. The Carona was the first of many Toyota products they bought over the years. When we moved back to this area in 1982, the old Carona was looking pretty sad, very rusty and it would soon be gone, replaced by another and another Toy of various models. The woman next door’s last car was an ’88? Camry that she bought days before she died playing golf from a burst anyeurism. The husband remarried and lived almost 20 more years, and he continued buying only Toyotas until the end. 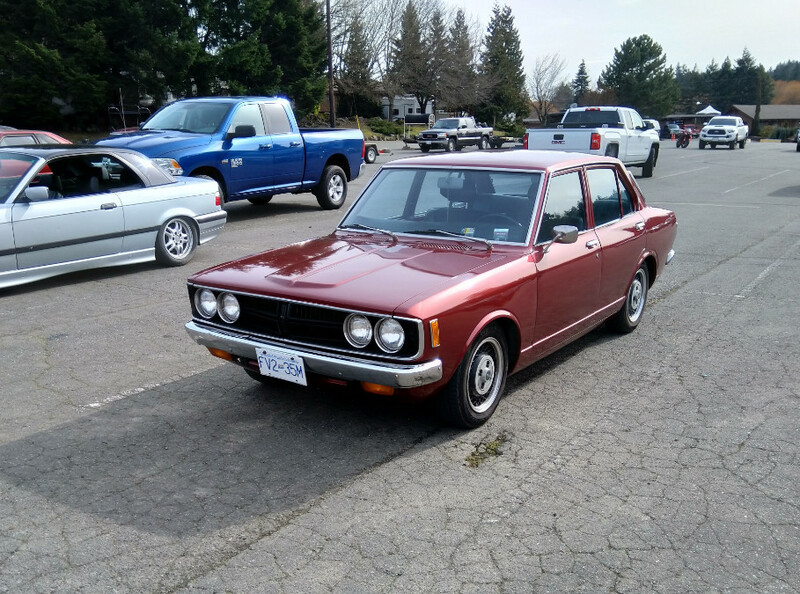 I’ve always thought Toyotas were underrated for their styling, as it often had a bit of hidden elegance in amongst the dullness, in the same way a Palladian structure – say, a State capitol – has appeal despite being stuffy and predictable. And then this sort of thing gives that the lie. It is so uneventful, such perfectly realised nothingness that it is hard to distinguish from it’s surrounds. Even when painted the colour of a half-decent red wine. Talking of colours, my view is tinted by the dreariness of the drive in these. As kiwibryce says above, poor handling and vague steering, to which I’d add reveless engine and wind roar. I cannot pretend that the “rare survivor” status of the pictured car is cause for dismay. I’ve seen a grand total of 2 hardtops of this model in Australia. (to our US friends we didn’t get the wagon here either, which was a bit strange as there was a gap between the Corolla and Crown wagons on our market). Years ago I saw a very clean looking powder blue one (it was driving in the opposite direction so I didn’t not get a good look) and more recently a very tatty looking one, in a similar condition to the one in this article. I was fascinated and a bit annoyed that these were not sold here when I was young but in hindsight I’ve realised it was no great loss as this hardtop is not the most attractive design and the car itself wasn’t that great, except from durability and reliability perspectives. The following Rt11x model from 73/74 was much nicer in every way but again we missed out on the GT/SR5 or any other sporty variant. One reason was a concern that it would have cannibalised Celica sales. Interestingly this was the only Corona generation (if you discount the pre RT40 Corona/Tiara) that was never available as a twin cam GT variant. You could add as many camshafts and gears and stripey bits and “G” ‘s and even “T” ‘s to this pile and I’d still not be able to see it if it was the only car in the carpark. I’ve seen a grand total of no hardtops here. Ofcourse, it’s always possible the place was littered with them given the above, but I reckon not. Anyway, two doors less than usual for this bundle of joys equals zero minus two, and THAT is going to be seriously hard to find find parked curbside or anywhere. 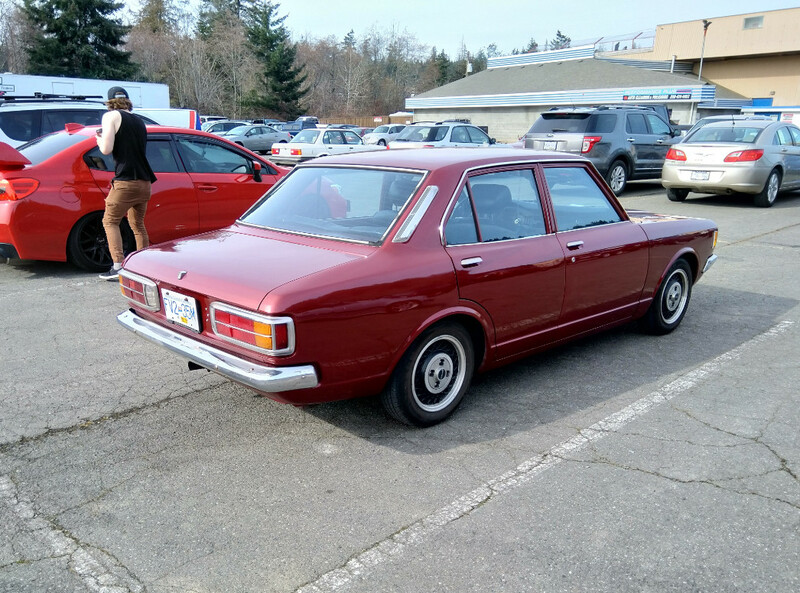 Speaking of Coronas…I spotted this mid-seventies sedan at a local home improvement store. 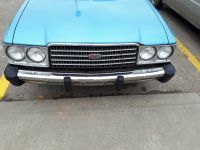 It has an early series license plate and judging by the state of the interior this is senior owned and loved. Someone more senior than me. My wife got creeped out by me taking pics so I didn’t shoot the interior. 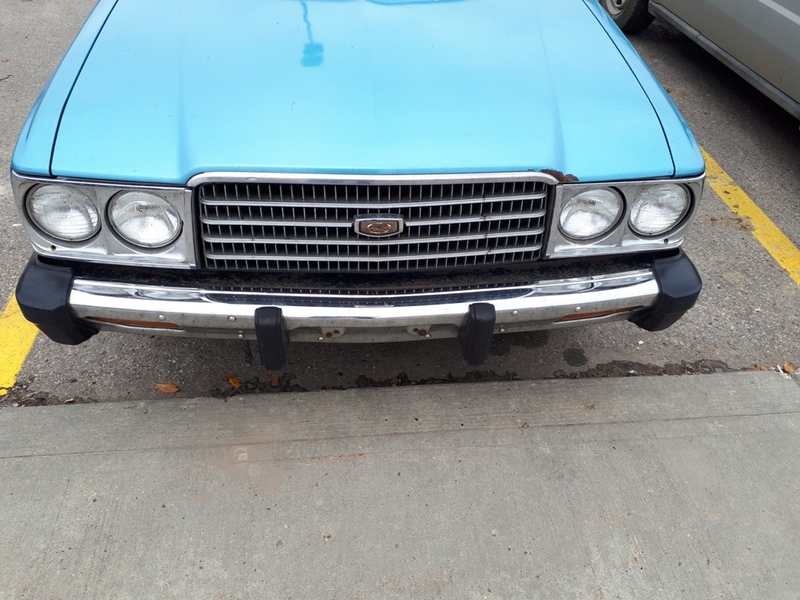 With minimal rust this Corona hasn’t been driven much over the years I don’t remember these much, probably because there just wasn’t many around. My uncle had one of these Coronas until he lost his license due to failing eyesight. I notice this one is carrying RX60 Cressida wheels.